The name says it all. Luxurious and comfortable furnishings along with a breathtaking view of the magnificent Rich Mountain is what brings folks here and keeps them coming back. 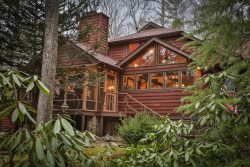 Privately situated, this home is perfect for those looking for a great place to get away and enjoy nature and the natural beauty of North Georgia. With 3 levels of decks and windows galore, your search to enjoy the scenery is easy. Sit on the large covered back porch year round, enjoying whatever season you happen to be in, or relax on the Master Bedroom balcony breathing in the clean mountain air. Watch and listen for one of the numerous Eagles that can been seen soaring the skies of this area. The house is designed for privacy offering a bedroom and bathroom on each floor making it perfect for 3 couples. The wood interior brings a warmth to the spaciousness of the great room along with the beautiful wood burning fireplace. A luxury hot tub sits on the terrace level patio which also leads to the fire pit where many a campfire has been enjoyed., The game room which hosts a pool table and ping pong table, provides a great place to have some fun. Luxury Lodge is conveniently located in between Ellijay and Blue Ridge so take advantage of some of the unique shopping and fabulous dining that both of these quaint towns offer. This was our first trip to that area. We were thoroughly impressed. Everything was just as described and even better. The game room was perfect for our four boys. The hot tub was amazing! The cabin was super clean and spacious for all 6 of us. We will definitely be going back. Everything about our stay was spectacular! The house was spacious, clean, the views were spectacular and the beds were extremely cozy. Great cabin with even greater views! Clean and fantastic floorplan to share with three different couples. Each couple had their own floor and view of the mountains! Amazing view. Very clean and up to date. Staff was very nice. Will definitely be renting again. The cabin was beautiful and had everything one could possibly need and more. Everything was clean and cozy! The views are amazing and the pictures dont do it justice! Sitting and swinging on the porch every morning and night to take it all in was a definite favorite! Loved making big meals in the open kitchen. The hot tub was the perfect way to unwind. Cozy fires every night. There isnt a bad view on any of the levels. It was so hard to leave and come home. The view was great, beds were comfortable, check in and check out was easy and directions to the house were very accurate! It was fantastic, from the check-in to the cleanliness. Although we spent much of our stay at the rental itself, there was still so much to do! We hiked amicolola falls and the Appalachian access trail, we visited cartecay winery on Saturday when they have love music, and checked out downtown Ellijay! Amazing stay and fantastic accommodations. I am so thankful for such a beautiful weekend getaway! Perfection This property was amazing! So clean, with everything you could possibly need in a serene setting. Will definitely be back! We had a great time. Everyone commented on how nice the cabin was. It was very secluded with great views and enough ameniities to keep us occupied. Would come back again. Luxury Lodge-Luxurious and Comfortable Clean, well appointed property. We were impressed with the quality of the linens, appliances, etc. Beautiful views from all three levels. Getting there on the gravel roads was a little rough for a standard vehicle, but doable. The property was very clean, inside & outside. Very quiet environment, most of the day. Close to Ellijay & Blue Ridge as well as waterfalls & fishing. We really enjoyed ourselves and hope to return. We hade a great time!!! My family and I very much enjoyed our stay at the Luxury Lodge cabin in Eliijay. The cabin is immaculately clean and very well appointed. The kitchen had everything we needed, the beds are comfortable and linens are very nice. We appreciated having the cozy blankets upstairs. Our teenage children enjoyed the ping pong table and pool as well as the fire pit for smores. We had a lovely weekend. The view is spectacular. I can imagine how the fall leaves must look from the upstairs deck. Again many thanks. It was a very nice stay. I appreciated that as I arrived in the area I had a few questions and emailed your company; I got an email reply with good information and suggestions within 20 minutes! I would recommend your rental company and this cabin. My family and I just got back from staying in your beautiful "Luxury Lodge" cabin! Everything about the cabin was amazing! It is spacious and decorated beautifully! The view literally took my breath away. It was so clean and organized as well! The staff member that I spoke with couldn't have been more helpful! We really appreciate all the time and effort put into making our stay wonderful! Thank you for sharing your amazing cabin with us! Our stay exceeded our expectations! We will be back soon! We enjoyed our stay at Luxury Lodge in the beautiful Blue Ridge Mountains. Mountain Oasis Cabin Rental staff as always were courteous and helpful in making our reservations. The cabin was clean and just what we needed for our mountain getaway. Thank you Mountain Oasis Cabin Rentals and I will recommend your services to family and friends in the future.